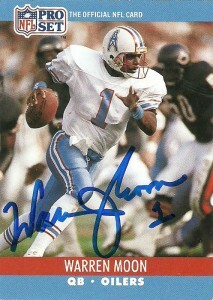 When I was a kid, I got Warren’s autograph at training camp one year. While not afforded the opportunity to attend nearly everyday (such as in the case of Cowboys Training Camp in Austin,) I did make the best of it when I went to Oilers’ camp in San Antonio. 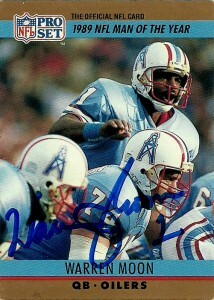 The players were also kind enough as well and I would typically haul in 15-30 autographs a day when I’d go. I never held it against Warren that I couldn’t get his autograph more than once, but resisted sending out again in 2011 (-for fear that I wouldn’t get it). I noticed a lot of multiple successes recently from the former Oilers great, and since I had gotten a lot of autographs from other members of the team, I thought I’d give it a shot. I sent out to his address in Kirkland, Washington but heard a week or two later that he had moved back to Southern California. With a lot of these successes happening in under 2 weeks, I got discouraged that I’d ever get the cards back. It did take a bit more longer than usual, but postmarked from Santa Ana, Ca (lending creedance to the rumor he was indeed living here) I got Warren’s autograph on these 3 additional cards in a still brisk 32 days. 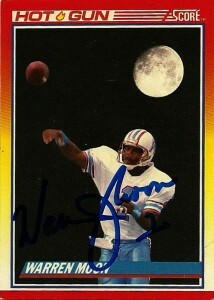 He also included a business card for Warren Moon Enterprises- Sports 1 Marketing. You can follow him through Twitter at twitter.com/WMoon1, Facebook at facebook.com/HWarrenMoon1 or go to his website at www.sports1marketing.com where you can locate his physical address if you wish to get his autograph as well.